Happy World Book Day! To be honest, every day is Book Day in our house, but it’s great that there is an international day dedicated to promoting books and reading. Interestingly, the date set by the UN is actually 23rd April each year, but as this clashes with the National Saint’s Day of England, and often falls in the Easter holidays, in the UK it is celebrated on the first Thursday in March instead. Somewhere cosy to sit, usually involving lots of pillows or cushions. I sewed three large cushions for it. And I don’t seem to have a photo of the whole room as it was then anywhere, but just to the right of the mattress was a little book case with his small collection of books. He was about a year old then. Just over a week before Oskar turned 4, his little brother was born, and since the baby was getting its own little corner in our room, with lots of new stuff, we gave Oskar’s room a mini makeover too. Ever since he had moved out of his cot in to a ‘big boy bed’, we had been using that to sit on for story time instead of the mattress, so we got rid of the mattress and turned his bed in to a sofa during the day instead, with the cushions and a new quilt I had made him, to cover the bed. We also added a reading lamp, and the bookcase moved a little closer to the bed. 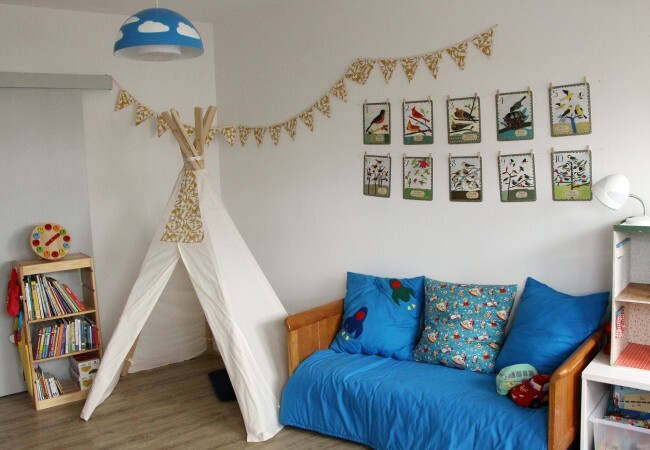 Originally, I’d actually thought the teepee, which we had made a year or so before, could double up as a reading nook – I’d seen quite a few used like that on Pinterest – but it turns out Oskar preferred the teepee for playing in, not reading. When we next moved house, the boys moved in together. They actually shared two rooms between them (which I have previously written about in more detail), one for sleeping in and the other for playing in. 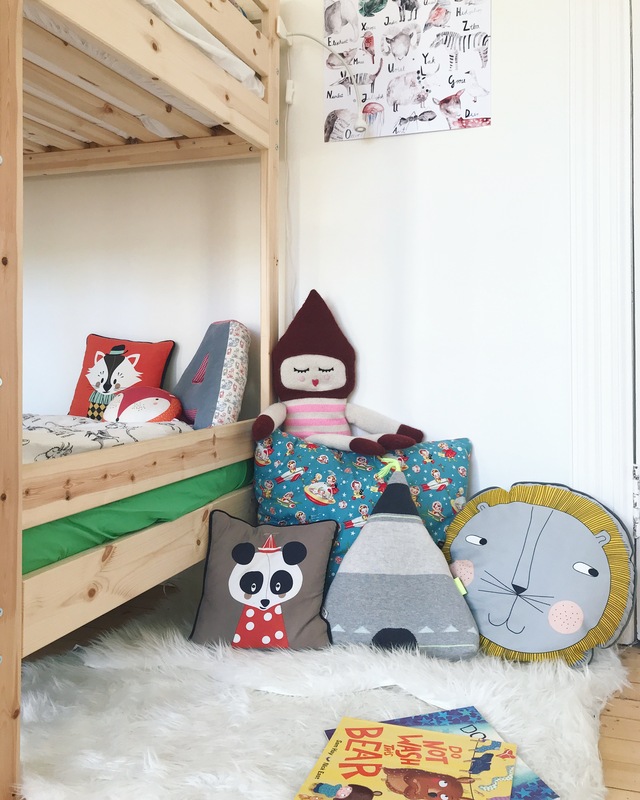 For the first year, Mr Fox still slept in his cot, but we had already invested in a bunk bed that he would eventually be moving in to the bottom bunk of, so in the mean time we used the bottom bunk of that as a reading nook, kitted out with our ever growing collection of cushions. Unfortunately I don’t have a photo of the set-up at that time, but you can see the bunk bed in the picture above. 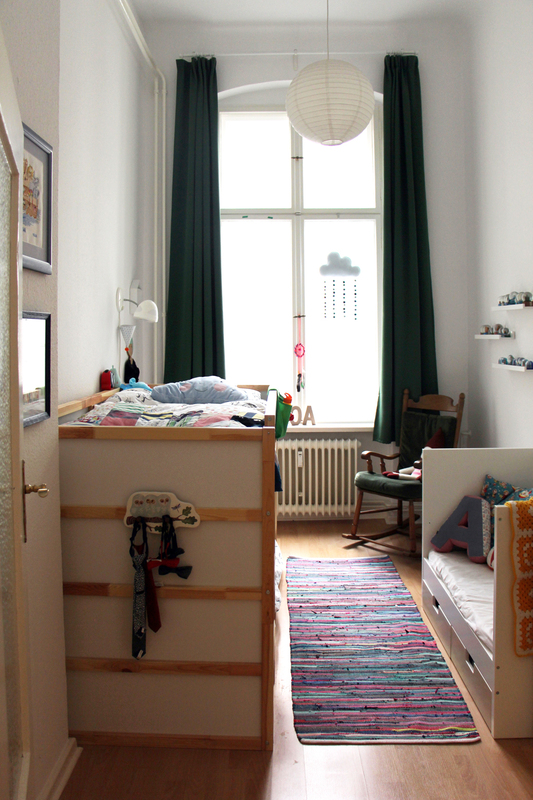 When he turned 2, the move to the bunkbed took place, and we were left with the question of what to do with his cot. We didn’t really need it anymore, but since they already had a separate playroom, we didn’t really need the extra space either. So we decided to take the side off and turn it in to a sofa, moving all our reading nook cushions over to it – and so a new reading nook was born! Incidentally, this nook was much more comfortable for us parents to sit and read with them, as the bottom bunk of the bed was very low so we always got a crook in our neck! We didn’t have a separate reading light for this nook, as the ceiling lamp was directly over the cot. To the left of the nook, you can see our little apple book shelf peeking out (if you’d like to make your own, check out my tutorial)! 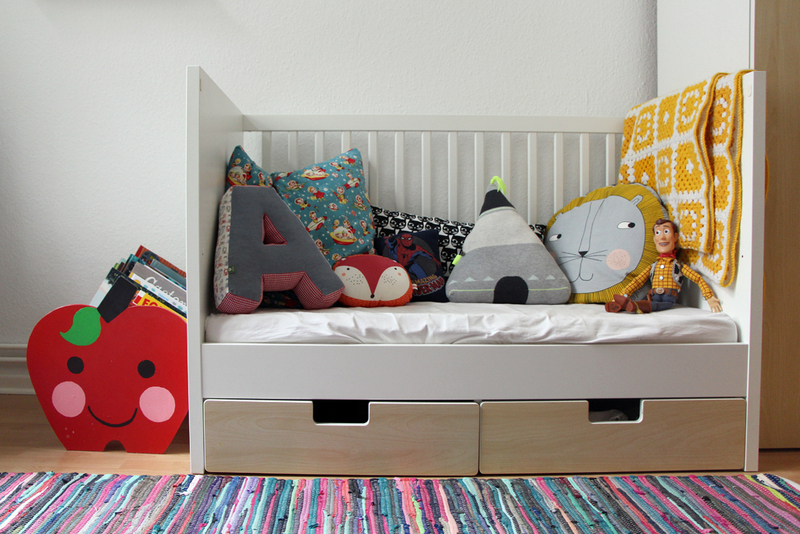 We tried to keep their bedroom as calm and uncluttered as possible, which meant no toys – except a bedtime cuddly friend – and most of their books, which had far outgrown Oskar’s original little shelf, were kept in a large bookcase in the playroom. So we used the little apple shelf in their bedroom, to keep a small selection of bedtime books, which we would change over every so often. Then, last summer, we moved again, and again the boys are sharing a room. This time, they only have the one room, as our new apartment is much smaller, but I was determined to still fit a small reading nook in somewhere. The unused little space between the end of their bed and the door seemed perfect for this, so a couple of sheepskin rugs and loads of cushions later, and we had ourselves a new little nook (by the way, I get asked this a lot, but the other door behind their bed leads to the box room, which can also be accessed from the hall so we closed this door off to gain more wall space). Their bookcase is just diagonally across from the nook, within reach, and the beautiful alphabet poster from Greta’s Schwester – one of our favourite little local boutiques in Berlin, which also has an online shop – seemed perfect for a reading nook. If you look closely you can see that I also added a reading light. 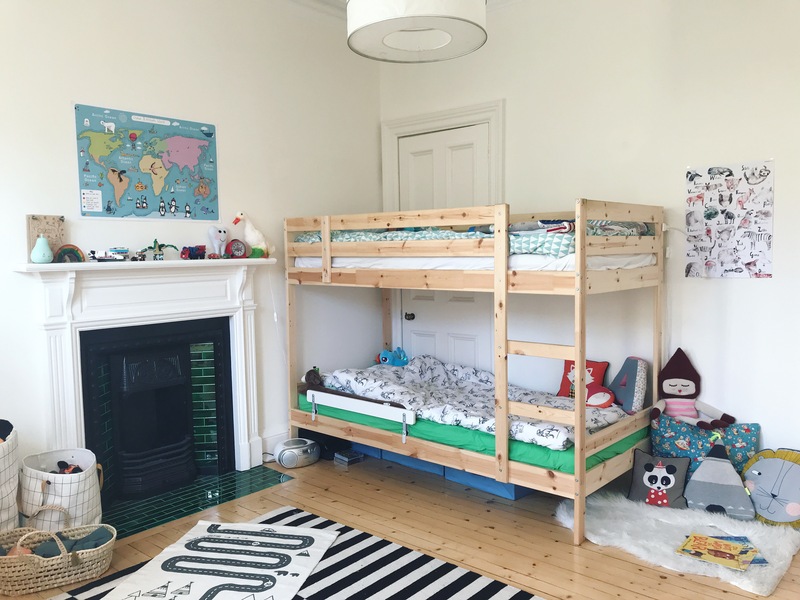 In reality, we usually end up sitting on the bed, when we are reading to both boys at bedtime – this one has more space on the bottom bunk, so no more crooked necks! – but for one on one readings session with only one of them, the nook is just the right size space. And I have also caught them sitting there either on their own or the two of them, looking at books! The little apple book case now resides in the living room, and it’s where we keep our seasonal books – which are the only books I rotate – as well as our library books. And that’s it, our four little reading nooks in three different rooms and houses. Do you have a reading or book nook in your house? I’d love to hear about it! Please feel free to leave a comment below, or you can also tag me in any pics on Twitter or Instagram. Did you know, The Bear & The Fox now has a monthly newsletter! Sign up to receive all the latest news, highlights and inspirations. As a welcome gift, all new subscribers will receive a free PDF with 26 budget friendly activity ideas for kids, from A to Z. Unfortunately we don’t have room for a reading nook in our current place as its a very small two-bed static home. But when we eventually move into a house I’d love to create one. Nothing better than a reading nook. My eldest has a beanbag in her bay window and the youngest a cushion zone. Oh I love that the boys always have a reading nook. That’s so cute. Oh what a great idea! I am an avid reader and I really need somewhere cosy where I can curl up and read. a book or magazine. I will taking notes from this post. Using a book holder for bed is also a great idea for people who like reading in bed. It is easily available online and also prevents neck pain as the book holder brings the book to your eye level even when laying down.